Simply having insurance does not solve the challenge related to medical bills that many Americans face. It is unlikely that this statement is shocking or even surprising to most. What could be construed as shocking, however, is how far reaching the problem is and the drastic measures people go to in order to pay for medical care. According to a Kaiser/New York Times survey, one in five working-age Americans with health insurance report problems paying medical bills. 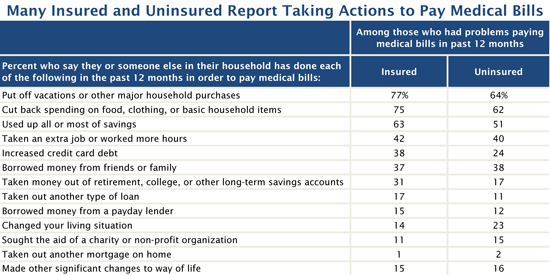 Among the insured with medical bill problems, 63% report using up most or all their savings and 42% took on an extra job or worked more hours. There is actually very little difference to the challenges facing the insured as compared to the uninsured. It’s no wonder that ACA adoption is more sluggish than anticipated and so many opt to pay the fine as opposed to premiums. According to a McKinsey & Co. healthcare article, the healthcare industry has a significant opportunity to make payments more convenient, less confusing, and easier to distribute over time all while repositioning medical bill payments in the household payment hierarchy. New payment solutions must tackle consumers’ confusion and concerns head on. Automated payments, structured payment plans or patient loans could contribute to a comprehensive program that could impact patient behavior. Such innovative payment approaches could create nearly $60 billion a year in value as well as achieve substantial savings in the administrative costs associated with inefficient processing and collections. People are skipping or delaying much needed care. Specifically, many with insurance are postponing dental care (62%), skipping doctor-recommended tests or treatments (43%), or not filling prescriptions (41%). This scenario flies in the face of a critical, stated goal of the ACA to make healthcare more affordable so clinicians can reach patients on a more preventive basis to reduce the need for high-acuity, high-cost procedures.